Dental Implants at our Commerce Twp MI Practice | Over 15 Years Experience! Are You Considering Dental Implants? Contact Our Commerce Dentist Office Today! Implants are an incredible way to improve the quality of oral health and smile! Of the many benefits, dental implants are extremely durable, maintenance is easy, and with proper care can last for a lifetime. Just like your natural teeth, your implants should be flossed, brushed, and regularly rinsed with mouthwash. The American Dental Association recommends to obtain replacement teeth as soon as possible, if you are missing one or more of your teeth. Dr. Sedki offers a free evaluation, to determine if dental implants are right for you. Typically, patients who are a good candidate for implants, have jawbone ridges that are in good shape and healthy oral tissues. Implants are different than dentures as implants are permanently anchored onto the jaw and cannot be removed. Dental Implants often are the best treatment solution for individuals wishing to replace multiple or a single tooth. Implant dentistry can also serve as an anchor for a denture or a bridge. To ensure long-term oral health, dental implants are often the best restorative solution. Our Commerce Twp dentist office can help you restore your smile again. Implant dentistry is a practical way to restore your smile after losing a tooth. Dr. B Sedki has been helping patients restore their natural smiles for over 15 years. 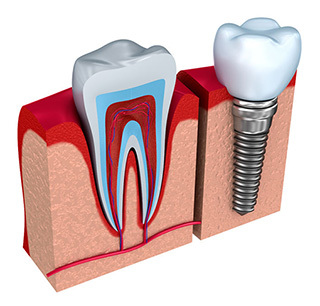 Dental Implants are made of titanium and are implanted into the jaw bone. These small anchoring devices serve as a replacement root for missing teeth. The implant fuses with the jaw bone and creates a base for the new tooth. The abutment serves as a base or anchoring point to provide support for the crown, porcelain crowns, or bridges. Implants are not removable as are dentures, and do not require healthy tooth enamel to be shaved off. 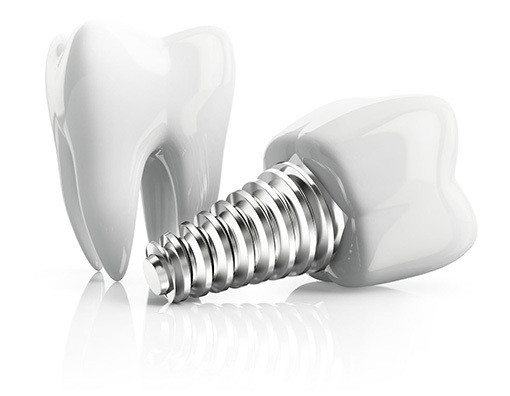 Dental implants serve both a restorative and cosmetic function. Both the surgical and restorative phases of dental implant treatment is completed by Dr. Sedki at our Commerce Twp office. After your implants are installed by Dr. Sedki, simple maintenance of your implants will lend many years of long lasting benefits and improved oral health. It goes without saying that great oral hygiene such as flossing and brushing, as well as regular appointments with your dentist is important. Individuals will find that implants offer several advantages over other forms of restorations (such as removable dentures, fixed bridges, and full-arch dentures). For example, implants installed by your dentist will slow the shrinking of your gum and bone tissue. This will help the prevention of premature aging. Call today for your free consultation with Dr. Sedki. He will take the proper time to thoroughly review your medical history and perform a detailed oral examination to determine if you are a candidate for implants. Rest assured Dr. Sedki will present you with the proper information so that you can make an informed decision. Dr. Sedki offers full-service dentistry at his Commerce MI dental office including: implants, dentures, crowns, bridges, and fillings! If you would like to learn more about dental health, visit the American Association of Public Health here.